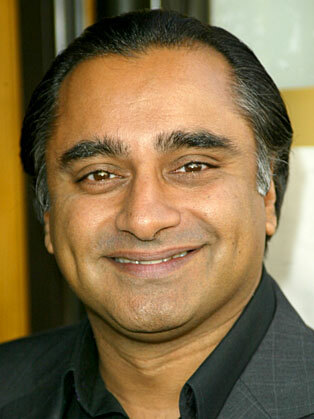 Sanjeev Bhaskar is a British Comedian. Sanjeev Bhaskar, OBE is a British comedian, actor and broadcaster, best known for his work in the BBC Two comedy series Goodness Gracious Me and as host of The Kumars at No. 42. Actor and writer Sanjeev Bhaskar first came to widespread public attention when he starred in the ensemble comedy sketch show, Goodness Gracious Me. He was spotted by the creator of Goodness Gracious Me, Anil Gupta, while performing in a show called Secret Asians, alongside good friend and musician, Nitin Sawhney. Sanjeev had already completed a marketing degree and was working for IBM while writing and performing in his spare time. Gupta asked Sanjeev to join the team working on his new idea for an Asian sketch show. Goodness Gracious Me began life as a radio show and was broadcast on Radio 4 in 1996. Starring Sanjeev, Meera Syal, Kulvinder Ghir and Nina Wadia, the show was a hit and, by 1998, it had crossed over to BBC2. Goodness Gracious Me ran to three series and played to sell-out audiences on tour. Sanjeev followed up this success with his solo venture, The Kumars at No. 42. He writes the show and plays the role of Sanjeev Kumar, who tries to host and broadcast a celebrity chat show from his parents’ living room. Sanjeev has a three picture screenwriting deal with Miramax. Keen to star on the big screen as well as write for it, Sanjeev can also be seen in Anita and Me, The Guru, The Mystic Masseur and Notting Hill.